This article is about the ancient Shakya Republic. For various communities using Shakya surname, see shakya (disambiguation). 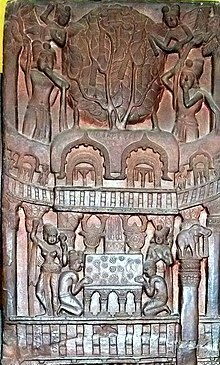 The Shakya (Sanskrit: Śākya, Devanagari: शाक्य; Pali: Sākiya, Sakka, or Sakya) were a clan of late Vedic India (c. 1000 – c. 500 BCE) and the later so-called second urbanisation period (c. 600 – c. 200 BCE) in the Indian subcontinent (present-day nations of India and Nepal). Gautama Buddha, called Shakyamuni "Sage of the Shakyas", the most famous Shakya. Seated bronze from Tibet, 11th century. The Shakyas formed an independent oligarchic[note 1] republican state known as the Śākya Gaṇarājya. The Shakya capital was Kapilavastu, which may have been located either in present-day Tilaurakot, Nepal or present-day Piprahwa, India. The best-known Shakya was Siddhartha Gautama, who was the founder of Buddhism (c. 6th to 4th centuries BCE) and came to be known as Gautama Buddha. [note 2] Siddhartha was the son of Śuddhodana, the chosen leader of the Śākya Gaṇarājya. The words "Bu-dha" and "Sa-kya-mu-nī" (Sage of the "Shakyas") in Brahmi script, on Ashoka's Rummindei Minor Pillar Edict (circa 250 BCE). There lived once upon a time a king of the Śākya, a scion of the solar race, whose name was Suddhodana. He was pure in conduct and beloved of the Śākya like the autumn moon. He had a wife, splendid, beautiful, and steadfast, who was called the Great Maya, from her resemblance to Maya the Goddess. Bharhut inscription: Bhagavato Sakamunino Bodho ("The illumination of the Blessed Sakamuni"), circa 100 BCE. Buddhaghoṣa's work (II, 1–24) traces the origin of the Shakyas to king Ikshvaku and gives their genealogy from Maha Sammata, an ancestor of Ikshvaku. This list comprises the names of a number of prominent kings of the Ikshvaku dynasty, which include Mandhata and Sagara. According to this text, Okkamukha was the eldest son of Ikshvaku. Sivisamjaya and Sihassara were the son and grandson of Okkamukha. King Sihassara had eighty-two thousand sons and grandsons, who were together known as the Shakyas. The youngest son of Sihassara was Jayasena. Jayasena had a son, Sihahanu, and a daughter, Yashodhara (not to be confused with Prince Siddhartha's wife), who was married to Devadahasakka. Devadahasakka had two daughters, Anjana and Kaccana. Sihahanu married Kaccana, and they had five sons and two daughters; Suddhodana was one of them. Suddhodana had two queens, Maya and Prajapati, both daughters of Anjana. Siddhartha (Gautama Buddha) was the son of Suddhodana and Maya. Rahula was the son of Siddhartha and Yashodara (also known as Bhaddakaccana), daughter of Suppabuddha and granddaughter of Añjana. Pali canon traces Gautama gotra (patriline) of Shakya to Rigvedic sage Angirasa. 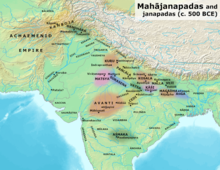 Map of mahajanapadas with the Shakya Republic next to Shravasti and Kosala. The Shakya republic functioned as an oligarchy,[note 1] ruled by an elite council of the warrior and ministerial class that chose its leader. According to the Mahāvastu and the Lalitavistara Sūtra, the seat of the Shakya administration was the santhagara ("assembly hall") at Kapilavastu. A new building for the Shakya santhagara was constructed at the time of Gautama Buddha, which was inaugurated by him. The highest administrative authority was the sidharth, comprising 500 members, which met in the santhagara to transact any important business. The Shakya Parishad was headed by an elected raja, who presided over the meetings. By the time of Siddharta's birth, the Shakya republic had become a vassal state of the larger Kingdom of Kosala. The raja, once chosen, would only take office upon the approval of the King of Kosala. While the raja must have held considerable authority in the Shakya homeland, backed by the power of the King of Kosala, he did not rule autocratically. Questions of consequence were debated in the santhagara, in which, though open to all, only members of the warrior class ("rajana") were permitted to speak. Rather than a majority vote, decisions were made by consensus. Virudhaka, son of Pasenadi and Vāsavakhattiyā, the daughter of a Shakya named Mahānāma by a slave girl, ascended the throne of Kosala after overthrowing his father. As an act of vengeance for cheating Kosala by sending his mother, the daughter of a slave woman, for marriage to his father, he invaded the Shakya territory, massacred them and annexed it. Procession of king Suddhodana from Kapilavastu, proceeding to meet his son the Buddha walking in mid-air (heads raised towards his path at the bottom of the panel), and to give him a Banyan tree (bottom left corner). Sanchi. Ashoka's Mahabodhi Temple and Diamond throne in Bodh Gaya, built circa 250 BCE. The inscription between the Chaitya arches reads: "Bhagavato Sakamunino/ bodho" ie "The building round the Bodhi tree of the Holy Sakamuni (Shakyamuni)". Bharhut frieze (circa 100 BCE). The Shakyas were by tradition sun worshippers, who called themselves Ādicca nāma gottena ("kinsmen of the sun") and descendants of the sun. As Buddha states in the Sutta-Nipāta, "They are of the sun-lineage (adiccagotta), Sakiyans by birth." It is uncertain whether, by the time of Siddhartha's birth, Vedic Brahmanism had been adopted to any significant extent by the Shakyans. Scholar Johannes Bronkhorst argues, "I do not deny that many vedic texts existed already, in oral form, at the time when Buddha was born. However, the bearers of this tradition, the Brahmins, did not occupy a dominant position in the area in which the Buddha preached his message, and this message was not, therefore, a reaction against brahmanical thought and culture." Purportedly, many Shakyans joined people from other regions and became followers of the Buddha during his lifetime, and many young Shakyan men left their homes to become monastics. According to Hmannan Yazawin, first published in 1823, the legendary king Abhiyaza, who founded the Tagaung Kingdom and the Burmese monarchy belonged to the same Shakya clan of the Buddha. He migrated to present-day Burma after the annexation of the Shakya kingdom by Kosala. The earlier Burmese accounts stated that he was a descendant of Pyusawhti, son of a solar spirit and a dragon princess. One view is that the name "Shakya" is derived from the Sanskrit word "śakya," which means "the one who is capable". Some scholars, including Michael Witzel and Christopher I. Beckwith argue that the Shakya were Scythians from Central Asia or Iran, and that the name Śākya has the same origin as “Scythian”. Indo-Scythians were known to have appeared later in South Asia in the Middle Kingdom period, around the 2nd century BCE to the 4th century CE. Gyan Swarup Gupta, Jayant Gadkari and the Encyclopedia Britannica use the term oligarchy. Stephen Batchelor refers to Shakya (using the alternative spelling of Sakiya) as "a proud oligarchic republic." Kurt Spellmeyer: "The best word, then, to describe the Shakyas’ government might not be 'republic' at all. 'Oligarchy' may be a more accurate choice: rule by the elite." Pankaj Mishra: "the Buddha was most likely not a prince, but a member of a republican oligarchy." Kenneth Pletcher, specifically referring to Shakya and other named states: "the fact that representation in these latter states' assemblies was limited to members of the ruling clan makes the term oligarchy, or even chiefdom, preferable." ^ Some of the stories about Buddha, his life, his teachings, and claims about the society he grew up in may have been invented and interpolated at a later time into the Buddhist texts. ^ Per J. F. Fleet, "The Inscription on the Piprawa Vase", Journal of the Royal Asiatic Society of Great Britain and Ireland, in Pāli, "Sākiya" is used primarily to refer to people of Shakya in general; "Sakka", primarily to the Shakya country as well as to its noble families; and "Sakya", primarily to members of the Buddhist order. ^ Groeger, Herbert; Trenkler, Luigi (2005). ""Zen and systemic therapy: Similarities, distinctions, possible contributions of Zen theory and Zen practice to systemic therapy."" (PDF). Brief Strategic and Systematic Therapy European Review. 2: 2. ^ Tropper, Kurt (2013). Tibetan Inscriptions. BRILL Academic. pp. 60–61, with footnotes 134–136. ISBN 978-90-04-25241-7. ^ a b c Law, BC. (1973). Tribes in Ancient India, Bhandarkar Oriental Series No.4, Poona: Bhandarkar Oriental Research Institute, pp. 245–56. ^ Leoshko, Janice (2017). Sacred Traces: British Explorations of Buddhism in South Asia. Routledge. p. 64. ISBN 9781351550307. ^ Misra, VS (2007). Ancient Indian Dynasties, Mumbai: Bharatiya Vidya Bhavan, ISBN 81-7276-413-8, pp. 285–6. ^ Ganga, Gautami; Bahadur, Himmat (2002). Subodh Kapoor (ed.). The Indian Encyclopaedia: Gautami Ganga -Himmat Bahadur (Volume 9 ed.). New Delhi: Cosmo Publication. p. 2677. ISBN 81-7755-257-0. ^ "India - Early Vedic period". Encyclopedia Britannica. Retrieved 18 March 2017. ^ Gupta, Gyan Swarup (1999). India From Indus Valley Civilisation to Mauryas. South Asia Books. p. 183. ISBN 978-8170227632. ^ Gadkari, Jayant (1996). Society and Religion. South Asia Books. p. 101. ISBN 978-8171547432. ^ Batchelor, Stephen (2015). After Buddhism. Yale University Press. pp. Chapter 2, Section 2, 8th Paragraph. ISBN 978-0-300-20518-3. ^ Spellmeyer, Kurt (Spring 2017). "Is the Dharma Democratic?". Tricycle Magazine. Retrieved 18 March 2017. ^ Pletcher, Kenneth (2010). The History of India. Rosen Education Service. p. 64. ISBN 978-1615301225. ^ Batchelor, Stephen (2015). After Buddhism: Rethinking the Dharma for a Secular Age. Yale University Press. p. 37. ISBN 978-0300205183. ^ Schumann, H.W. (2016). Historical Buddha (New ed.). Motilal Banarsidass. pp. 17–18. ISBN 978-8120818170. ^ Walshe, Maurice (1995). The Long Discourses of the Buddha: A Translation of the Digha Nikaya. http://lirs.ru/lib/sutra/Long_Discourses_of_the_Buddha(Digha_Nikaya).Walshe.pdf: Wisdom Publications. p. 409. ISBN 0-86171-103-3. ^ Batchelor, Stephen (2015). After Buddhism. Yale University Press. pp. Chapter 2, Section 2, 7th paragraph. ISBN 978-0-300-20518-3. ^ Ikeda, Daisaku (2012). Living Buddha: An Interpretive Biography. Middleway Press. p. 6. ISBN 978-0-9779245-2-3. ^ Nakamura, Hajime (2000). Gotama Buddha: A Biography Based on the Most Reliable Texts, Volume 1. Kosei Publishing Company. p. 124. ISBN 978-4333018932. ^ Norman, K.R. (2001). Group of Discourses (Sutta Nipata). http://www.ahandfulofleaves.org/documents/SuttaNipata_Norman_1997-2001.pdf: Pali Text Society at Oxford. p. 51. ISBN 0860133036. ^ Bronkhorst, Johannes (2011). Buddhism in the Shadow of Brahmanism. BRILL. p. 1. ISBN 978-9004201408. ^ Sangharakshita (2004). Buddha's Victory. Windhorse Publications. p. 47. ISBN 978-0904766509. ^ Datta, Nonica (2003). Indian History: Ancient and Medieval. Encyclopaedia Brittanica (India) Pvt. Ltd. p. 90. ISBN 978-8179910672. ^ Hla Pe, U (1985). Burma: Literature, Historiography, Scholarship, Language, Life, and Buddhism. Singapore: Institute of Southeast Asian Studies. p. 57. ISBN 978-9971-98-800-5. ^ Lieberman, Victor B. (2003). Strange Parallels: Southeast Asia in Global Context, c. 800–1830, volume 1, Integration on the Mainland. Cambridge University Press. p. 196. ISBN 978-0-521-80496-7. ^ Chandra Das, Sarat (1997). A Tibetan-English Dictionary: With Sanskrit Synonyms. New Delhi: Asian Educational Services. p. 582. ISBN 81-206-0455-5. Buswell, Robert Jr; Lopez, Donald S. Jr., eds. (2013). "Śākya", in Princeton Dictionary of Buddhism. Princeton, NJ: Princeton University Press. p. 741. ISBN 9780691157863. Rhys Davids, C.A.F. 1926. ‘Man as Willer.’ Bulletin of the School of Oriental and African Studies. 4: 29-44. Silk, Jonathan A. 2008 ‘Putative Persian perversities: Indian Buddhist condemnations of Zoroastrian close-kin marriage in context.’ Bulletin of the School of Oriental and African Studies, 71: pp 433–464. van Geel, B. et al. 2004. Climate change and the expansion of the Scythian culture after 850 BC: a hypothesis Journal of Archaeological Science. 31 (12) December: 1735-1742.